If you have not been to our office in the past and would like to schedule an office visit or house call you can call us or pre-register online. Read articles and watch videos from these categories. DASH (Disabled Association Support of the Homebound) provides help to many people that are homebound. Treating patients in their homes makes the patients happier and healthier and also saves money for the government. The money saved can be used as housing subsidies for the disabled and the elderly. The Federal Independence at Home Act is the best hope for repairing our broken health care system. Learn more by reading and watching these slide shows, articles and videos. Roosevelt Island’s relationship to its namesake, President Franklin Delano Roosevelt, has much to do with FDR's affliction with polio, his personal battle with the disease, and the Island’s history as a pioneer in moving people disabled by polio out of hospitals and into the community. 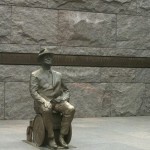 Read articles and watch videos about the story of FDR, Roosevelt Island, and the disabled and about the monument to FDR rising on the Island's southern tip. Jews and Arabs can live together peacefully – even in the Middle East. Learn about the Arava Institute.